I have quite a lot of ringtones and notification sounds on my phone, and also sound files from the adventure games that I play with ScummVM – all of which I do not want to show up in Symbian’s native music player on my Nokia N97. These miscellaneous tracks are not a problem when you listen to playlists, or a specific album, artist or genre, but when you use the shuffle feature, you don’t want to suddenly hear a loud alarm, or a screech from The Dig, that ruin your groove. Ideally, we would be able to set the Symbian music player to only include MP3 files from a specific location, but since Nokia apparently thought that was a redundant setting, we have to do it the hard way. The trick is to add the System attribute to the folders that contain the sound files you don’t want in the music player. They will then be ignored by the player. Unfortunately, they will be ignored by all other applications as well. Because of this, you have to mark the folders with the System flag, update your music library, and then remove the System flag again if you want those sounds to be available for other applications. 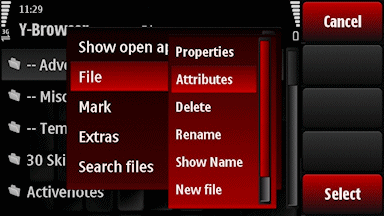 To mark folders with the System flag, you need a freeware file manager called Y-Browser. Download and install the app. You can download Y-Browser from the Ovi Store as well if you prefer that. Launch the application and navigate to the folder that you want to hide from the music player. On the Nokia N97, E:\ is the mass memory, and F:\ is the memory card. With the folder selected, tap Options > File > Attributes and then change the System setting at the top from No to Yes. Tap Save and repeat this procedure for any additional folders that you might want to exclude from Symbian’s native music player. Now launch the music player, and tap Options > Refresh library. Wait until the application has scanned your device for sound files, and when the player has refreshed your library, all the sounds in the System folders should have been removed. To let other apps use the sounds you’ve just hidden from the music, remove the System attribute from the folders with Y-Browser as described above. If you have added more songs to your device, and need to refresh your music library, you naturally have to hide the folders again. You also have to repeat the procedure if the music player does an automatic update of the music library. Y Browser now costs money. So I’m back to looking for another way of solving this problem. Thank you for your very informative and accurate article. I without a hesitation i left a click of an gratitude on the page.